Yushu (altitude 3700m population 40,000, over 90% Kham Tibetan) also known in Tibetan as Jyekundo, has long been a major trading centre. Nomads can travel days on horse, motercycle or other vehicles over rough raods to trade and access business, medical and government services. 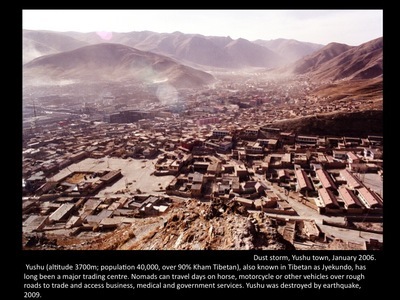 Yushu was destroyed by earthquake in 2009.